Scholarship for Malaysian to Study in UK ditawarkan oleh pihak British Council Malaysia untuk pelajar-pelajar Malaysia yang berminat dan berkelayakan. Proses pemilihannya memang agak ketat kerana jumlah biasiswa yang ditawarkan tidaklah banyak mana tetapi jika ada peluang anda patut mencuba untuk merebutnya. Tahun ini berberapa biasiswa ditawarkan oleh British Council untuk pelajar Malaysia pergi belajar di berberapa buah university di UK. 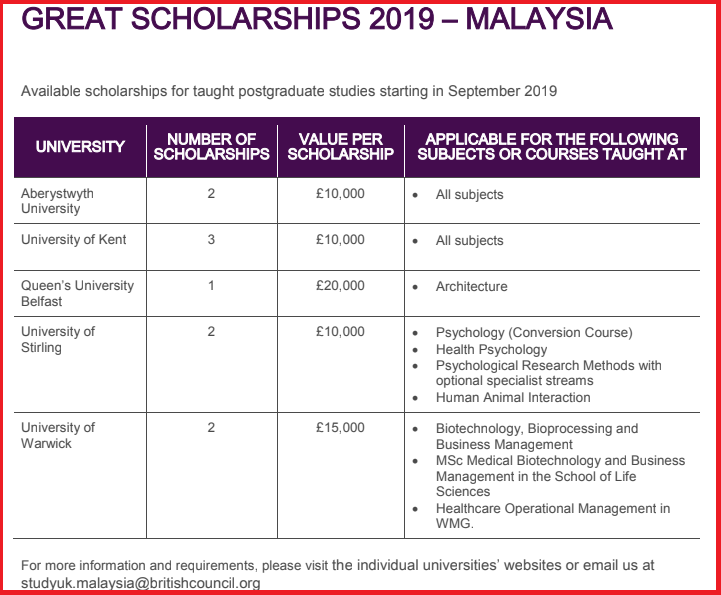 In order to support more Malaysian students to study in the UK, the British Council, together with five UK universities, has launched the GREAT Scholarships 2019 – Malaysia campaign. With ten taught postgraduate scholarships on offer, the total value of the scholarship scheme up to £100,000. This new scholarship scheme will offer an exciting opportunity for Malaysian students wishing to get financial support to pursue postgraduate study in the UK. Students can apply for taught postgraduate courses in subjects including law, business, art and design, biosciences, IT and more at five institutions across England, Scotland, Wales and Northern Ireland. Sila rujuk gambar di bawah untuk senarai universiti dan kursus-kursus yang ditawarkan British Council Malaysia. Sila layari laman webportal rasmi British Council Malaysia untuk maklumat lanjut mengenai biasiswa ini. British Council Scholarship (Biasiswa British Council), interested in applying for funding to help you achieve your goal of studying in the UK? British Council IELTS scholarship award was launched again this year for Malaysian students. If you are interested and qualified for this scholarship apply now. The British Council IELTS Scholarships are awarded to high-calibre individuals with motivation to develop their career and who demonstrate the potential to contribute to society what they have gained from their study experience. IELTS scholars are committed to networking within the IELTS community and sharing their experience with other IELTS candidates. The scholarship enable students to study any chosen course in an undergraduate or postgraduate programme of a higher institution that accepts IELTS as part of its admission requirements. Local prizes: Five prizes worth RM10,000 as tuition fee subsidy. The following are the criteria for Biasiswa British Council that one must have to apply this scholarship. read them carefully. Follow the 3 simple steps and guidelines below. For more information contact the British Council office through email. 4. Download the LIST OF BURSARIES AND SCHOLARSHIP for Malaysian. a. Applicants are initially reviewed against the British Council (Biasiswa British Council) IELTS Prize eligibility criteria. Both the personal statement and IELTS score will be taken into account. b. Shortlisted candidates will be required to give a short presentation and be interviewed by a panel of senior managers and external raters from higher education and/or corporate sectors. f. A regional panel will name the five grand prize winner based on their previous video-taped interview performance. Note: For more details and enquiries about British Council scholarship (Biasiswa British Council) you may email to: kualalumpur.exams@britishcouncil.org.my or contact the scholarship provider directly. The British Council Education UK Exhibition 2014 is back! If you are looking for an opportunity to study in UK this is where you can get all the information. The British Council will be holding a series of Education UK exhibitions in Malaysia. The event series will be held in Kuala Lumpur Convention Centre in KL; G Hotel ballroom in Penang; Hilton ballroom in Kuching; and Hyatt Regency ballroom in Kota Kinabalu. The official opening of the ‘Education in Ireland’ office at the main campus of Tunku Abdul Rahman (TAR) College was held when the Irish Minister for Training and Skills, Mr Ciaran Cannon TD, visited Malaysia recently. This is to provide an opportunity to study in many universities in ireland for international students to get higher education Ireland. The event was hosted by TAR College with the Ambassador of Ireland Mr Declan Kelly and other Irish officials in attendance. “This is the first office established in Malaysia by ‘Education in Ireland’ and represents a major step in bringing Malaysia and Ireland closer together in terms of education services for student to be able to choose wide ranges of education courses offered by the both country. Higher education in Ireland is know are among the best in the world. Heriot-Watt University has opened its second overseas campus with a new centre in Malaysia. The campus, based in the city of Putrajaya, will teach degrees in business and ­postgraduate studies in renewable energy, engineering and surveying. Putrajaya is the university’s fifth campus and joins ­facilities in the Capital, the Borders, Orkney and Dubai. It was officially opened by ­British high commissioner Simon Featherstone, and teaching will start in January 2013. The university is part of a £35 million development in Putrajaya and the whole campus will not be completed until 2014. The university said it will cater for 4,000 students. Foreign students have a higher chance of getting into British universities than locals as long as they can meet requirements and pay tuition fees up to £20,000 a year. In a report from the Daily Mail, Edinburgh, Manchester, York, Newcastle, Sheffield, Bath and Cardiff universities are among those placing no restriction on recruitment from outside the European Union. Clearing listings on the UCAS website show that places are available on 149 history courses for international students but only 24 for home/EU applicants. The system is unfair to British pupils who do better than expected in their A-levels because they are denied admission, even though the university is still recruiting. Universities are heavily fined if their recruitment targets for home and European Union students exceed while there is no limit to non-EU students. The University of Nottingham Malaysia Campus (UNMC) offers full scholarships to students in the newly launched School of Biomedical Sciences. This scholarship is open to students who have received at UNMC in Bachelor of Science in Biomedical Sciences in September this year. University will offer four full scholarships (tuition fees) for Biomedical Science students in the first year of study for September 2012 intake. All the offers to BSc Biomedical Sciences with a minimum A-level grades AAB (or equivalent) are invited to apply. Application forms available online (pdf) or can be obtained from the Admissions Office. Applications will be accepted until August 20, 2012. The candidates will be notified by early September. The University of Southampton’s first overseas campus has begun enrolling students after the project received academic accreditation from the Malaysian authorities. The campus, which is based in the south of the Malay Peninsular close to Singapore, plans to admit around 60 students in October 2012 for its four-year master of mechanical engineering programme. Students will be able to study in English in Malaysia for the first two years of the programme before transferring to the UK campus for the last two years. The campus is being established on a regional development called EduCity, with Southampton being the second UK university to establish a presence there. A medical school set up by Newcastle University, also its first overseas campus, opened its doors this month on the site. Don Nutbeam, Southampton’s vice-chancellor, said that achieving education accreditation 10 months after signing an agreement to open the campus was a “tribute to the hard work of the project team”. 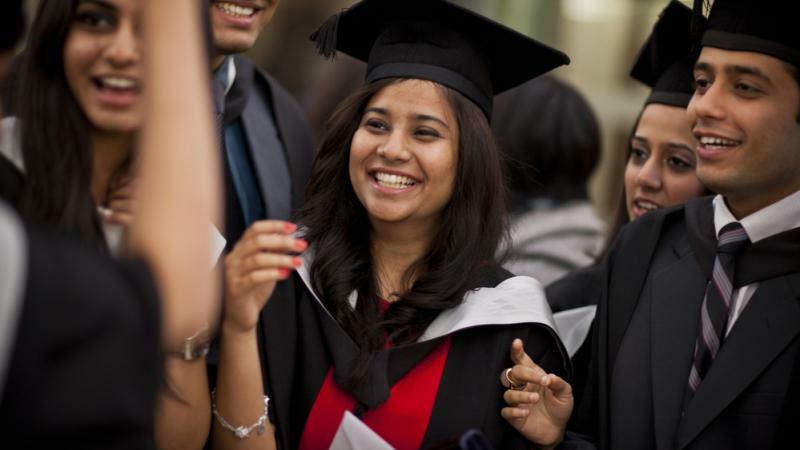 If you are thinking about university degree in UK this is a very good opportunity for you. Colum Miller Scholarship 2012 at University of Edinburg is available. It is open to Malaysian or to student from any country. Although applications for the scholarships should be made before 31 May 2012, the scholarships will only be awarded to applicants who have firmly accepted their offer through payment of the deposit. Applicants who hold full sponsorships are not eligible for the scholarship.